I was more than a little excited to hear last week that a remake of the classic point ‘n’ click dungeon crawler Shadowgate had landed on Kickstarter. So I couldn’t pass up the chance to talk with one of Shadowgate’s designers, Dave Marsh. He’s been with the game every step of the way since it was first released back in 1987 for the Apple Macintosh, and for each of Shadowgate’s successive ports to a wide spread of platforms. I was trying to think about its closest modern day counterparts and, while it clearly shares a lot with other adventure games, I think it’s got more than a little in common with Hotline Miami. You begin the game at the doors of Castle Shadowgate and you must make your way through its dark corridors and dragon infested caves to confront the warlock who’s been terrorising the kingdom, to get there, though, you must first learn the patterns of the castle, overcoming each rooms’ puzzles, learn the best order to approach its dangers. Especially as every wrong decision ends in a gruesome death; even taken too long about progressing sees your torch burn out and your character trip and break their face. Plus, it had a soundtrack that’s equally compelling. 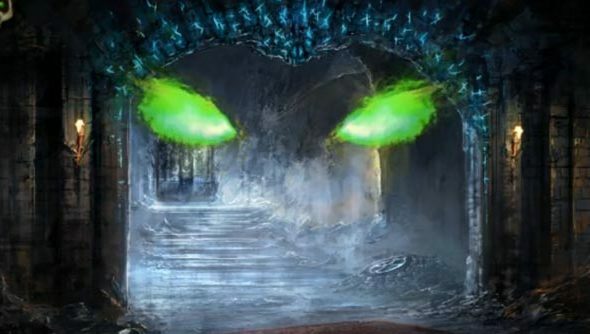 PCGamesN: First off, why are you remaking Shadowgate? A lot of the nostalgia projects that have turned up on Kickstarter have been “We want to make a game in the same vein as our old classics” but you’ve chosen to actively remake Shadowgate. Dave Marsh: Well, Shadowgate is more than just a remake of the original game. We didn’t want to just port the title over to the newer devices out on the market. What we wanted to do was to re-imagine and update the game and make the title in a way that we had always envisioned – relatively free of the delivery constraints of the past. This includes adding full screen, immersive rooms and a complete game score (two actually!) and sound design. We also wanted to add a ton of new puzzles and re-visit every puzzle in the original game, making sure they hold up. We wanted to do all this while paying homage to the parts of the game that older fans cherish. PCGN: So you’re actually re-designing parts of the game?Which puzzles have you found don’t hold up and what’s the process of redesigning them? DM: Heh. Well, speaking EPOR to the rope was one that we always grimaced at (although I have heard from some fans that really liked that one). So, that room got a pretty big remake. Karl and I have been basically going thru every room and every puzzle and ask ourselves how well each holds up. If either of us feel that it needs work, we spend as much time as we need redesigning it and seeing what other puzzles and rooms and objects this one redesign might touch. It’s a pretty lengthy process but it’s pretty gratifying once you hit on a better puzzle experience! PCGN: You recently tried to Kickstart Sherlock Holmes. Already Shadowgate has been much more successful, you’re over half way to your traget and still have two weeks on the clock,do you think that’s down to the fanbase of Shadowgate or have you approached the pitch differently? DM: It’s probably a bit of both. We learned a lot from the Sherlock Holmes campaign and tried to approach Shadowgate applying those learned lessons – mainly spending more time in pre-production, reaching out to the fan community and press and rethinking the pledge tiers and rewards. I think the response we have received so far is testament to the popularity of the game and that the fan base is out there wanting one of their favorite games available once again. PCGN: Shadowgate did always seem a little apart from other adventure games: the brutal deaths for any wrong decision, for instance. Will we be seeing that again in the remake or will you be a little more forgiving? DM: You have to admit there is a certain charm to the way that death and dying were handled in Shadowgate. We want to keep that wry, sometimes sarcastic sense of humor about deaths. This is primarily because we try to allow the player to do most anything they want with objects and the command system. So, if they choose to GO out the window in a castle tower, then we want to provide an appropriate response. One thing we have heard over and over was how scary Shadowgate was when it was first played by our audience- we definitely will keep that sense of danger around every corner. PCGN: But, I think, it went further than just being playful;death often led to a complete restart, and beating the castle was an iterative learning of all the puzzles and the right way to move closer to the end. Something that drove this was the way that you could make it impossible to proceed – opening the acid filled sarcophagus, say – forcing you to restart and learn not to open that crypt. Was this deliberate, will it be the same in this reimagining? DM: Even in the original game we made sure that you wouldn’t get too stuck. We typically offered multiple ways to get around. In the instance of the acid blob in the crypt room- you could have doubled back and gone up through the room with the rope to get to the Mirror Room. In certain aspects Shadowgate was non-linear- and this is one thing we will make sure we retain for our new version. We plan on lots of interaction with objects and environments and on allowing multiple ways to complete puzzles. We want the player to have lots of choices and feel as if they are in control of their play. Now, that said, we are currently going thru the areas and puzzles that we felt were too obscure and frustrating to ensure that the play makes sense and is well-balanced. PCGN: Gargh, of course. If I’d worked that out when I was younger it would have saved many a restart! But what you say about overlapping puzzles and multiple ways through it is interesting, how do you design something like that? DM: Well, we approached the game in pretty big chunks. First we started with the main quest, finding the most important objects and solving the biggest puzzles to get those objects so you could defeat the Warlock Lord. Once we had those puzzles, objects and rooms down, we began filling in the game play in between. Adding smaller (but no less deadly J ) quests, puzzles and rooms to flesh out the experience. PCGN: That sounds logical (though, still, impressively complicated!) One of the other changes you talk about in your Kickstarter pitch is the redesigned UI. I’m a bit of a nerd on UI’s and would love to hear more about it: the original game had nine different commands, an inventory, minimap, all vital for the game but it did make the screen quite cluttered. How does your new UI learn from more recent adventure games? DM: Most of the classic elements form the original game will be there and then some. However, our approach is to not necessarily to have all elements of the UI on the screen at the same time. Rather, we want to take advantage of each device and have the elements readily available when the player wants them. This includes bringing up the command system when they want it as well as a full screen inventory/spell book and updated, robust game map. We also are making sure that tapping an object with a mouse or your finger triggers the default command for that object (ie. Tapping a sword EXAMINES it while tapping a door OPENS or CLOSES it). Our goal is to make the UI unobtrusive but accessible while allowing the player to be immersed in the game. We are still in pre-production, so much of what we are planning needs to be tested and then we will make the best decisions based on how the game plays and feels. PCGN: Sure, though from the footage you show in the pitch video it seems much less present. It does great service to the artwork, the game is looking beautiful. 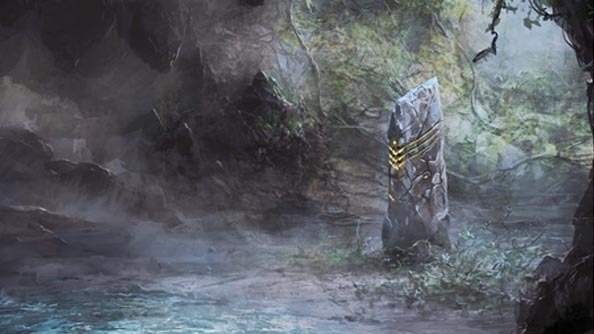 From the video, a number of the environments seem to already be completed. How far along in the game’s development are you, do you have an expected release date if all goes to plan? DM: Thanks! Yes, the look and feel of the game art and audio is coming along nicely but we are still only in pre-production. We’ve made good progress on illustrating room backgrounds in order to determine the look of the game but all of the animation we have shown is conceptual as we work through how we will handle object and environmental/particle animations. We are also testing out multiple game engines and ironing out how the room scripting engine will work. We are targeting a November 2013 release date for the Windows and Mac version of our game. Android and iOS will hopefully be released a few months after that. PCGN: Do you have plans for stretch goals? Would it be expanding the castle? Would you consider making the engine available for modding, to let players make their own castles and puzzles? DM: We have talked at length about what else we could do for the game. We would love to expand the castle and add puzzles, voice over and scene animations that go into greater detail about unresolved questions from the original: What happened to the wizards who built this castle? Why were you chosen and summoned to Shadowgate? And what pacts did the Warlock Lord make to gain his dark power? As for modding, we can add that to the list and see where we are once we our goal met. PCGN: Over the years, meeting fans of Shadowgate, are there any puzzles that kept coming up for discussion? DM: We get lots of questions and comments about the game. Mostly it’s about the torches, how fun the deaths are treated or the NES game music. But I think one of the iconic puzzles of the game is the dragon room where it keeps torching you while you are trying to ransack the room. They ask a lot about what was in that chest. They also want to know about places that are blocked off (the rubble in the waterfall room) or the locked door in the room that contains the well. TBH, the real reason these are there is that we ran out of room on the floppy back in the day and had to cut the room that those exits led to. However, we would love to address that now in the new version! We are really excited about re-establishing Shadowgate into the gaming world again. It was so well received on every platform it was developed on and the reception to this new version has been awesome. We have four massive binders that contain the design for the game’s sequel (Beyond Shadowgate) and we would love to continue to introduce the player to the deep, fantasy world of Shadowgate! Shadowgate is currently seeking funding on Kickstarter.